Here is another place where language can be confusing. For many companies, operating expenses and SG&A are the same thing. SG&A stands for Selling, General, and Administrative expenses and includes the day to day expenses not directly related to manufacturing the product or selling the service. Some companies refer to operating expenses as SG&A, or just G&A, while others treat G&A as one subcategory and give sales and marketing (and possibly other specific categories of expenses) its own line, all under the heading of operating expenses. Often a company will make this distinction based on the relative size of each. 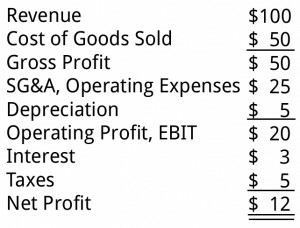 In this sample income statement, you can see how SG&A expenses are deducted from revenues along with other expenses to yield profit. Amounts shown in thousands. What if a company’s net profit is lower than it ought to be? 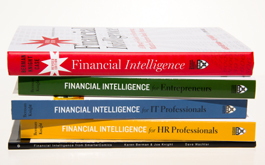 Aside from monkeying with the books, there are only three possible fixes for low profitability. One, the company can increase profitable sales. This solution almost always requires a good deal of time. Two, it can figure out how to lower production costs and run more efficiently. This, too, takes time. Three, it can cut operating expenses (SG&A), which almost always means reducing the headcount. This is usually the only short-term solution available. That’s why so many CEOs taking over troubled companies start by cutting the payroll in the overhead expense areas. It makes earnings look better fast. Of course, layoffs can backfire. Morale suffers and that’s not the only danger. For most companies, it’s better to manage for the long haul and to focus on increasing profitable sales and reducing costs (of goods sold). Sure, operating expenses may have to be trimmed. But if that’s your only focus, you’re probably only postponing the day of reckoning.